Vonetta Flowers grew up playing sports and excelled at basketball and track and field. But if you had told her that she would go on to make Winter Olympic history, she would probably have laughed when she was younger. Flowers' track coach at the University of Alabama in Birmingham said she’d be the next Jackie Joyner-Kersee. So track was what she had on her mind. After winning seven All-American nods and six conference MVP honors, before Flowers graduated from college, she had dreams of competing in the Olympics but fell short at the 1996 trials. It was after that that she hung up her running cleats. In 1998, there was a big push to get former track stars to try out for the bobsled team, and Flowers went for it. Flowers and her teammate Bonny Warner set a world start record in October 2000 at Park City, Utah. 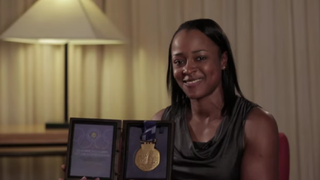 And on Feb. 19, 2002, Flowers' dream finally came true when she became the first African American to win a gold medal at the Winter Olympics.